Finite-state machine (FSM) or finite-state automaton design of a simple car security alarm using StateCAD, and implementation on a Digilent FPGA Spartan 3 Starter kit board.. 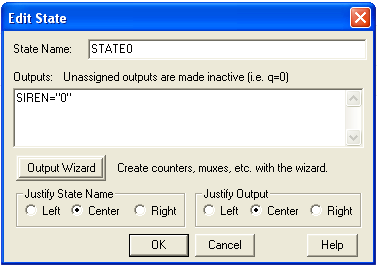 In this part we will generate the VHDL code. In part II we will simulate and in part III we will implement the VHDL code in our Digilent Spartan 3 Starter kit board. 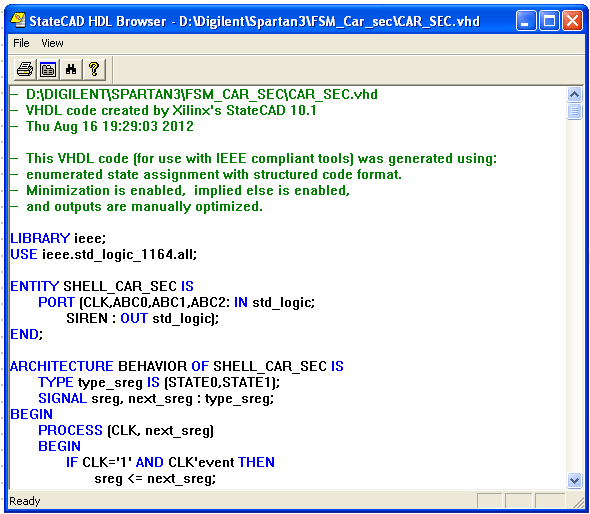 StateCAD allows visual implementation of a State Diagram and translation into a Hardware Description Language (HDL) code. It is not necessary to understand the HDL code, however we have little control over how the software translates the state diagram. We will create a state diagram for a car security alarm, and generate VHDL. In part II we will simulate our state diagram to check whether it behaves like we expect. In part III we will create the schematic symbol and implement the VHDL code in our Diglent Spartan 3 board, and finally test the car security alarm to ensure that it works as expected. 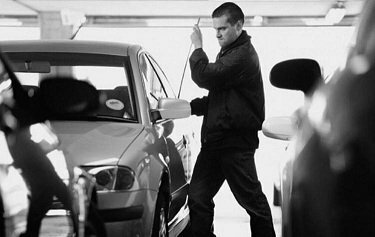 We wil devise a simple Car Security Alarm that will sound a siren if the car alarm system has been energized i.e. armed (A=1) and the door is open (B=1) and / or an ultrasoic sensor signals movement inside the car (C=1). 1) In STATE0 the siren is off (SIREN=0) if the alarm is not energized that is armed (A=0) and the door (B) or the ultrasonic sensor (C) can be in any combination, or if alarm is armed (A=1) the siren will not sound if door is closed (B=0) or no presence is detected within the car by the utlrasonic sensor (C=0). 2) There is a transition from STATE0 to STATE1. if alarm is armed (A=1) and if either the door is open (B=1) or ultrasonic sensor detects a presence within the car (C=1) or both the door is open and ultrasonic sesnor detects (B=1 and C=1), the siren will sound, and the system will remain in STATE1. 3) The system will remain in STATE1 that is. siren will be sounding whatever happens next to the door (either is closed or open or sensor detects or not, provided the alarm is still armed (A=1). 4) Transition from STATE1 to STATE0 occurs only if the system is desarmed (A=0). and in this circunstance for B or C, the siren will not sound anymore (SIREN=0). Our aim is to obtain a State Diagram as shown above. 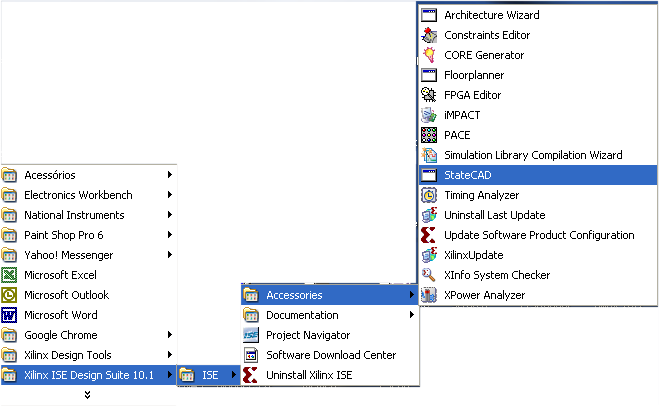 Open StateCAD by navigating thorugh the Start menu: Start -> Programs -> Xlinix ISE Design Suite 10.1 -> ISE -> Accessories -> StateCAD. 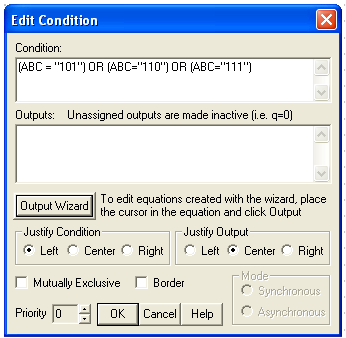 Change the name to ABC and the range to 2:0, as shown in the figure and click OK. If you have done everything right the window will show all the variables in your drawing. Click OK. NOTE: You can make modifications here if it is required. NOTE: Warning windows may pop up before Results, to tell you for example that compilation has found remnants of variables you may have added and invitate you to delete them, that you must do. NOTE. 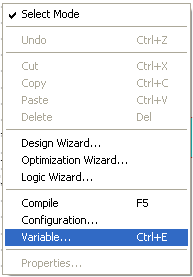 You can check now if the code makes sense, but can do nothing else apart going back to the drawn project and edit it. We are just about ready to simulate the state diagram and implement the VDL code in our Xilinx FPGA, something that we will do in parts II and III of this tutorial. The drawing and generated VHDL files can be downloaded from here. A special credit is due to Examples from Class pdf found at University of Wrocester site, for the state diagram. This tutorial uses a completely different approach to achieve the code generation. 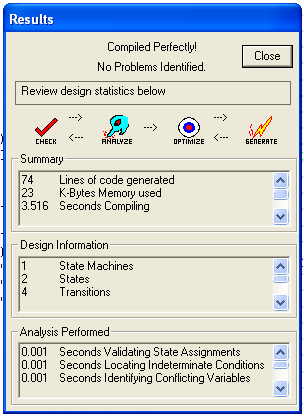 We have designed a State Diagram in StateCAD and compiled a VHDL file. In part II we will simulate the state diagram and in part III we will program our Digilent Spartan 3 board, and test physically the logic circuit. This entry was posted in Electronic Projects, Electronic Simulation and tagged Car Alarm, Digilent, Finite State Machine, FPGA, FSM, HDL code, Spartan 3, State Diagram, StateCAD, Xilinx. Bookmark the permalink.